The booking of Relaince Jio's JioPhone has been closed for some time. Information about this is given in the official website. A message in the website says that 'millions' people have already pre-booked the notes. The booking of JioPhone was started on Thursday evening at 5:30 pm. The website and the app were crashed for a while due to the high demand. Now when Geo's Pre-booking of this feature phone has been discontinued, it is difficult to tell when the booking will start again. However, according to information given on the website, users who are in pre-booking will be notified. Pre-booking has been discontinued due to JioPhone's high demand. 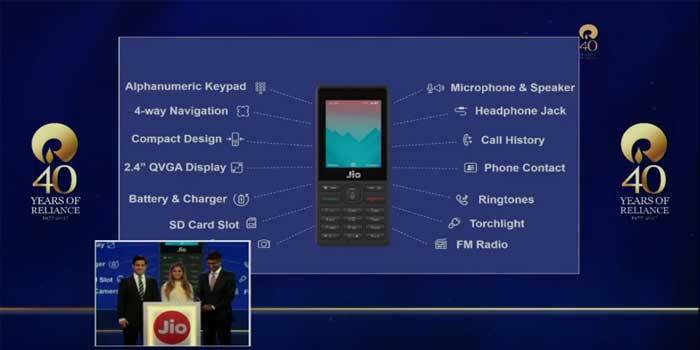 Customers will have to pay 500 rupees for pre-booking of JioPhome. For this, customers will have to pay a total of 1500 rupees for feature phones. But when a buyer purchases JioPhone after a pre-booking, only Rs 1500 will be paid. The company is taking 1500 rupees for a security deposit, which will be returned to the bank after 3 years of the deposit.